Imagine a world of almost limitless opportunity: land in every direction could be bought for a song; eager customers with nowhere to shop; and jobs available to anyone able to step off the train. Coupled to this vast economic potential was a feeling of expansive, infectious optimism that gave everyone the feeling that they had arrived in the right place at the right time. And, nobody cared less if you were Jewish. Western European, mostly German Jews had been arriving in noticeable numbers since before the Civil War. Revolutionary turmoil attended the gestation of the modern German state in the 1840-50's and many Jews decided to move elsewhere for their health. Although some arrived directly by sea, there was a steady percolation of people from the Eastern Seaboard through communities in the South. A few took up farming in central Texas, but most settled in towns in their line of march like Jefferson and Marshall or near the Gulf ports of entry, Galveston and Victoria. Those two nodes, the NE earlier and the Gulf later, constitute the major points of entry for the flow of Jewish immigration into eastern Texas. In 1886 Bnai Israel, the Reform congregation in Galveston, hired Henry Cohen, an Orthodox-trained rabbi from London. He would be associated in one way or another with Jewish settlement in Texas for most of his 62-year tenure. Many of the investors in the Gulf, Colorado, and Santa Fe Railroad, which moved up the Brazos River Valley then turned west to San Angelo, were members of Cohen's congregation. Later, the Galveston Plan would ally prosperous (German) Jews in New York and Galveston in a scheme with both social and economic benefits for its supporters. Railroads, like shopping malls today, were the development instruments of their time. Government charters promised large tracts of land along the railroad alignment in exchange for its construction. Rail access "quickened" the land around it, increasing its frontage value just as freeways do. 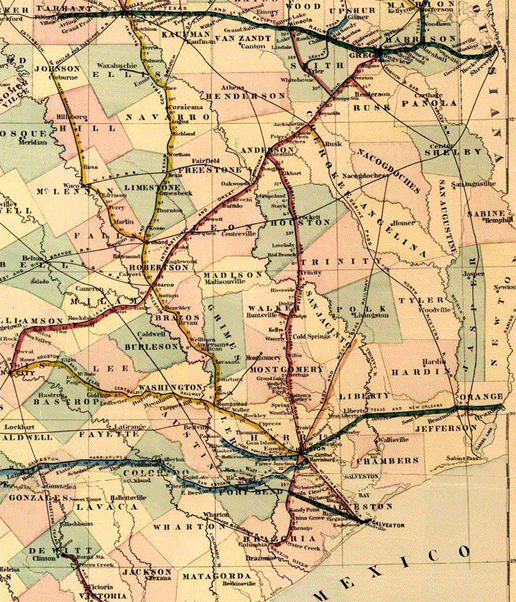 Passengers holding their one-way tickets to Richmond, Rosenberg, Sealy, Bellville, Brenham, Somerville, Caldwell, Milano, and points west were all potential customers for building lots. Most Jews coming to small Texas towns were nominally Orthodox, by training and culture. In a very short time, however, they either moderated their religious practice or made their way to the big cities. Kosher meat, mikvahs, schools for the children, and learned men were, then as now, hard to find in the country. The Reform Pittsburgh Platform of 1885 turned those defects into virtues and provided a tolerable, "American" program for many small town synagogues. The older communities in the northeast like Marshall were more predisposed to the Reform view from the beginning, but most towns eventually came around to acceptance if not affiliation. By 1910 there was a Jewish presence in many county seats and trading towns in the state. This often took the form of a Hebrew Free Loan or other self-help society, subscribers to the Jewish Publication Society, or a cemetery. During this, the period of the Galveston Plan, the clash between already established, Westernized German Jews and the less seemly Ost Yuden lately out of the shetl played out in their deliberate distribution to ports far removed from New York City. The social tension between these two groups never really dissipated. In time, however, the preponderance of Eastern European Jews flavored most communities. Communities formed often as a widespread network of small towns linked to a trading center. Everyone came together for the holidays in the local Oddfellows Hall or similar quarters. After WWI some of these places managed to build synagogues, which took no small effort, resources, and will. Some towns had it, most didn't. Brenham with a handful of families built an Orthodox Shul before the turn of the century, while Calvert with more than 40 families and a few wealthy donors never got anything out of the ground. The building of the synagogue was the ultimate representation of communal energy. In the prewar years it was a haven for those whose English might still be heavily accented and others for whom acculturation was painful. In the postwar years it was a demonstration of the successful conclusion of that process. Few in the old country knew they would fetch up in Lockhart or Harlingen or Sherman, but some dreamed of Spindletop. Settlement in one or another town along the railroad may have been largely accidental, but places like Breckenridge, Wichita Falls, Kilgore, and Port Arthur were destinations at the ends of rainbows. News of the oil booms from 1900 through the early '30's travelled worldwide and brought immigrants to these places to make their fortunes. Few did, but many stayed to have children, sell dry goods or pick up scrap iron. The traces of family dispersion can be easily read in the places that remain, indicating the boundaries and extent of their nets. Names that appear in Jefferson in 1870 show up in Marshall in 1900 and Sherman in 1930. Wives come from Corsicana and uncles open stores in Texarkana, then move to Breckenridge. Similarily stories told in Baytown are repeated in San Angelo, and people in Brownsville recall relatives held up by banditos on the train from Marlin. Wherever they came from and however they disbursed, this three-generation-old phenomenon has now contracted into the big cities. In the north from Texarkana to Abilene, Corsicana to Sherman they've moved to Dallas-Fort Worth, in the south to Houston and San Antonio. The small towns were wonderful places to grow up, but nobody wants to go back.